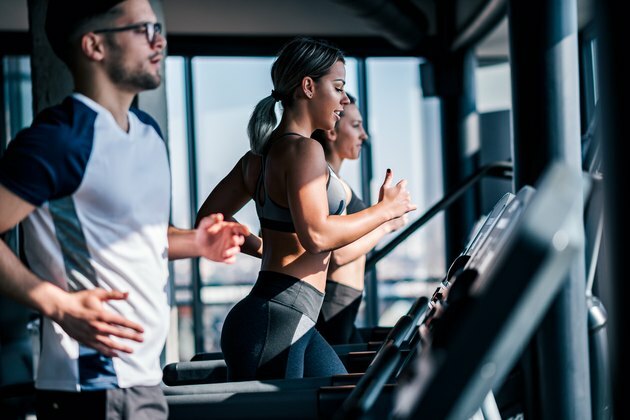 When you're motivated to exercise and determined to get results, spending extra time at the gym may seem like a good idea — but more exercise is not necessarily better. To get the best workout results, it's important to find a balance between duration, intensity and recovery. This will get you the best results while sparing you from adverse effects of overtraining. When it comes to exercise, it's not always about the amount of time you spend at the gym, but rather, the quality of your workout. Spending hours at the gym each day can lead to overtraining and a desire to abandon your fitness plans. To the layperson, exercise is a function of calories being burned to generate energy. While this is fundamentally true, energy recruitment during exercise is a bit more complex; your body draws upon different fuels, called substrates, for activities of different intensity and length. For very high-intensity exercise lasting for less than two minutes, such as heavy weightlifting or an all-out sprint, your body generates energy without oxygen, drawing on muscle stores of creatine phosphate and glycogen, the storage form of glucose. It's easy to see why it's critical to know the maximum workout time to build muscle. For the lower-intensity exercise of longer duration like walking, running or cycling, your body uses oxygen to burn glycogen and fat. Your exercise goals for cardiovascular training should determine the length of your cardiovascular workout. If your interest is simply cardiovascular fitness without concern for weight loss, the Center for Disease Control and Prevention (CDC) recommends 30 minutes of moderate-intensity aerobic exercise five days per week. If fat metabolism and weight loss is your goal, the CDC says that you may need to increase the amount of time each day beyond the 150 minutes. Lifting weights before doing your cardio will deplete glycogen stores and force your body to recruit fat earlier in your cardio session. When it comes to weight training, knowing the maximum workout time to build muscle is essential. Your muscles rely on limited stores of creatine phosphate and glycogen when lifting weights. This equates to about 10 seconds. Available stores of both substrates vary from one individual to the next depending on nutrition status and storage capacity, which is enhanced through exercise. In other words, weight training sessions lasting longer than 30 minutes could be breaking down rather than building up muscle. Spending too much time exercising and not allowing enough time between sessions for muscles to recover can result in overtraining syndrome marked by irritability, apathy, sleep disturbances, loss of appetite and moodiness. This can lead to a decrease in your workout results. To prevent overtraining, allow for sufficient recovery time between training sessions. This can mean anywhere from 48 to 72 hours between training sessions for the same muscle group. No matter how determined you are to stick to your training regimen, listening to your body and taking a break when you feel sore or exhausted can help you achieve better results in the long run. Read more: How Long Should You Take Time Off From the Gym? How Long Does it Take the Human Body to Adapt to a New Exercise?